dc Talk is no witness. rock n' roll "Christian" groups. Their album "Supernatural" recently debuted at number 4 on Billboard between the Satanic Kiss and the Satanic Marilyn Manson. The kicker is what a member of dc Talk said when asked what he thought of the Satanic Marilyn Manson. For those that don't know, Marilyn Manson blasphemies the name of Jesus Christ straight-up. I'm talking Marilyn Manson the weirdo, the sicko, the deceived one, who don't veil his contempt for Jesus in no kind of way. 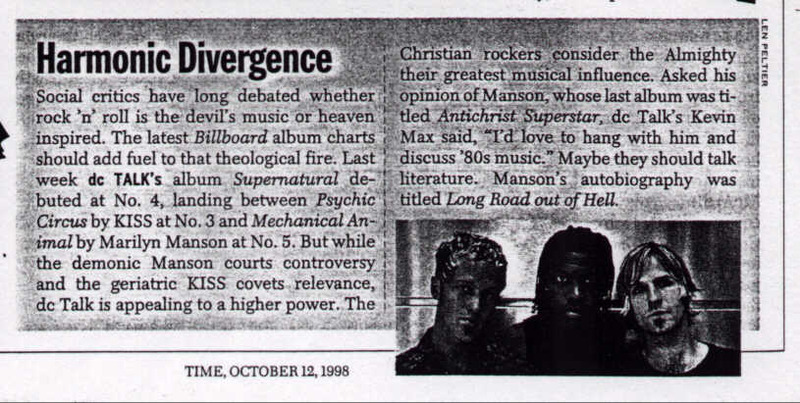 Look at what dc Talk's Kevin Max said when asked about Marilyn Manson. I'll let you read this short article for yourself. Notice how Time Magazine can see the issue more clearly than Max.